Absolutely gorgeous work by Wayne Barton - and YOUR practice boards show you are getting there quickly!!! I'm a bit confused by the concept of a carbon steel knife taking longer to sharpen than an HSS knife, and holding an edge longer. Is it possible that you have that backwards? Al, I highly recommend his books and knives. He also has a dvd for sale and I would bet money that it is excellent as well. Tell Sandy to go for it! Mike, I double checked and it says "...high carbon alloy steel tempered to keep its edge razor sharp for hours of carving." I can tell you that it did take a very long time to sharpen the workhorse knife and it did hold its edge for a long time, but I know virtually nothing about metal, so I can't say for sure that it's harder than HSS. I'm only repeating what he told us. The website just says 'alloy steel' which says nothing about it... steel *is* an alloy, so it's like saying 'a four-legged breed of cat'. I mean, it doesn't narrow it down much. Another thing that is weirding me a bit is how his 'ultra-fine' ceramic stone is 1800 grit. I've got an 8000 grit ceramic stone, and you can get them a lot finer than that (30000+ grit). However, maybe it's something that just doesn't translate well, or maybe I'm just too tired to clue in after a 15 hour day at work. Both of these steel alloys can be hardened to quite a range on the Rockwell scale. For metal working, HSS performs better than high carbon (of the same Rockwell hardness) because it works well at the high heat levels of fast turning edges. High carbon degrades too quickly for these high heat applications. For woodworking, and other low heat applications, the high carbon steels, such as A2, are being tempered to higher hardness than their HSS counterparts. I don't know, but suspect that the HSS tempering to lower hardness is probably part of standardized industrial practice intended for the high speed high heat tools, and left unchanged for simple woodworking tools. The extra Rockwell hardness is why the high carbon tools hold an edge longer. 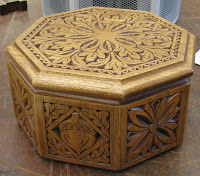 Now, about those carvings: Fabulous! Visiting your blog is dangerous; it has introduced another art which I would like to learn. ... so little time and so many wonderful things to do. Thanks for clearing that up about the tool steel, Bob! 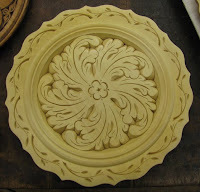 Wonderful carvings! I totally enjoyed your write up! 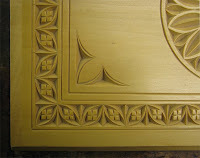 Are you planning a future chip carving detail for one of your next projects? I can't wait to see..
Beautiful stuff Kari - thanks for sharing. Your practice boards are great! Now that is the kind of woodworking I could get into. After watching one of Wayne's videos, I think I understand the cuts I see in your practice boards. Very nice work, BTW! One question: Are those straight lines on the right half of the lower board free hand, or assisted with a straight edge? Thanks again for bringing us beautiful work! 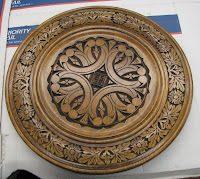 TGEA, I'm thinking about reproducing one of my Swedish grandma's rosemaling plates in chip carving. I think it would translate well. I'll be sure to document the process! Shazza, you can do this!!! What does Wayne charge for his workshops? Stephen, the 2-day class at Olde Mill was $300. I don't know if that's a standard cost or not for his classes. You can email him at: wayne.barton@comcast.net for more info. So basically, Kari, you're saying it IS something you can take with you? Actually, that's a great thought. I tend to sit in my truck during my lunch breaks at work, listening to the radio or enjoying the sounds of the birds in the wooded area or even catching 40 winks... It would be fun to sit out in the parking lot, the back door of the truck opened, chip carving for 60 minutes. I took this seminar as well last weekend. Kari - great writeup and pictures. Wayne has some very entertaining stories in addition to providing a wealth of chip carving knowledge. Any future students, ask him about the circus or a certain artifact at a Swiss museum. 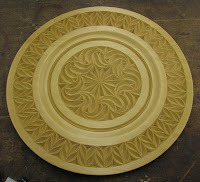 And as mentioned above, heading out to your car and chip carving is an option as that exactly what I did with my lunch breaks this week as I practiced what I learned. I was initially concerned with trashing my car with chips, but it was very easy to dump the chips as I went into a trash bag - of course I am not too concerned as my car is 15 years old. 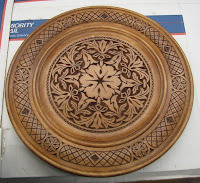 Nice post.One of the things I like about chip carving is it's something you can take with you on vacation, like whittling..
Gonna need some chip carving video how to! Gorgeous stuff! Wayne is a great teacher. I've taken his class at John C. Campbell folk school. You learn a LOT. The only down side is if he finds out you don't like accordion music...he has a lot of it and will torture you for hours!